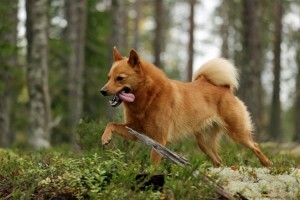 The Finnish Spitz is a hunting dog of the Spitz family originating from Finland. Systematic and selective breeding and development began at the end of the 1890s with the primary stock being taken from the remote areas of northern and eastern Finland. In those times the peoples of the region had very little to do with outsiders because of their remote location, so their ways and habits and the characteristics of Finnish Spitz were long kept pure and distinctive. 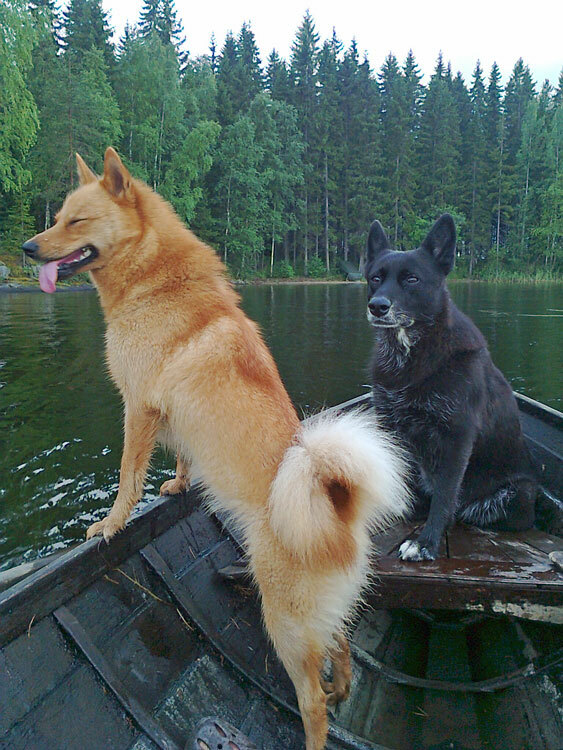 They were first registered as a breed by the Finnish Kennel Club in 1892 and became known as Suomenpystykorva In 1979, the 90th anniversary of the Finnish Kennel Club, the breed was proclaimed the “National Dog of Finland”. They are keen hunters and are predominately used in Finland for hunting capercaillie, a large bird of the grouse family. Sometimes they are also used for hunting elk and even bears, for their lightness of foot enable them to keep just out of reach of the large antlers or fearsome claws. 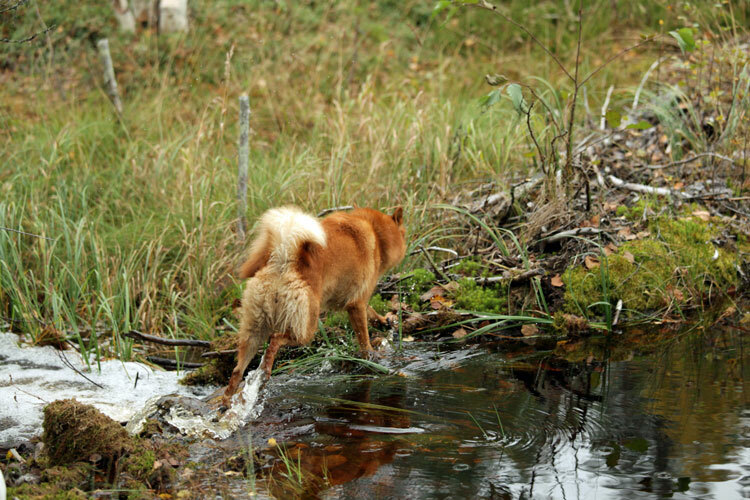 When hunting capercaillie, Finnish Spitz are trained to seek and follow the bird until it settles in a tree, whereupon they begin to bark softly and sway their tails with the feather-like hairs to attract the bird’s attention. These actions seem to mesmerise the bird to being lulled into a false sense of security in the tree and to concentrate entirely on the dog whose barking then gradually becomes louder and louder until it is a clear and distinctive ringing tone carrying through the quiet forest and drawing the hunter’s attention to where the bird is situated. The sound made by the dog drowns any noise made by the hunter as he approaches to gain position to shoot and, should the bird fly off before the hunter is in position, the dog will cease barking and follow the bird until it resettles in another tree when the procedure starts again. 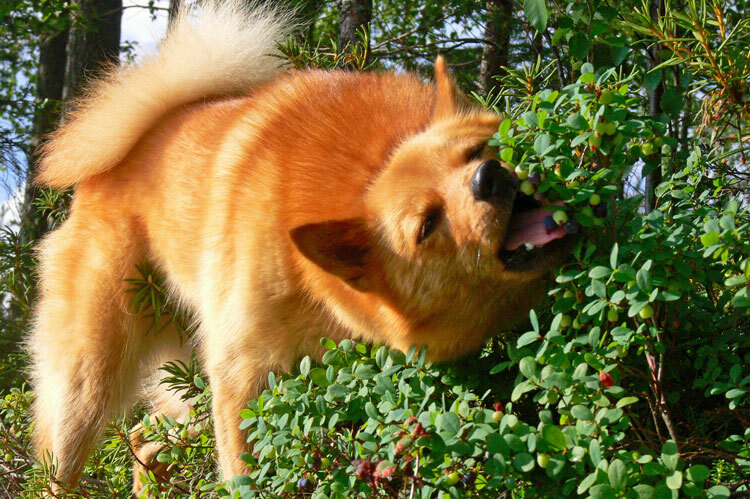 It might seem strange to those who are unfamiliar to the breed, but official barking competitions are held in Finland to find the “King of the Barkers” when the actual periods of time a dog holds a bird in a tree by barking are recorded – the longest time is the winner. The Finnish Spitz is thoroughly Finnish in character – independent, sensitive, sturdy, tough, cautious and suspicious of strangers at the start, lively light-footed and extremely alert. Underneath it all they are good-natured, gentle and faithful once they make friends and completely attached to the master. In Finland they are trained to bark at capercaillie and, as this has become inherent in their nature over the years, they really like the sound of their own voices. This could be annoying to us in Britain but they can and should be prevented from barking mindlessly. It is therefore essential that they be gently but firmly handled as puppies, enchanting as they may be, for they have the unsurpassed ability to control the master if left uncorrected. All this also makes them very good house and guard dogs, warning the master of any unusual circumstances or strangers. The breed is extremely healthy and generally only requires visits to the Vet for vaccinations against the normal canine diseases. 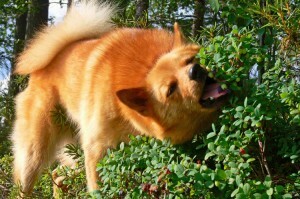 The coat is typical of the Spitz breeds with an outer coat of long, coarse hairs of a red-gold to chestnut colour over a dense, woolly undercoat of a cream colour. 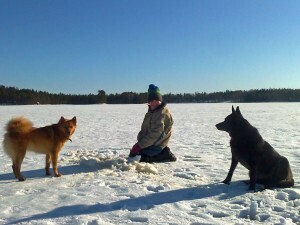 Being outdoor dogs in their native land, they like lying in the snow or in a cold wind for the undercoat protects them, as in all Nordic breeds – but they are not averse to lying in front of a warm fire in the evenings either. They are remarkable for their cleanliness, even washing themselves and each other much like a cat, and they have no distasteful odour like some breeds, even when wet. Very little grooming is required and they only lose their coat when moulting, usually twice a year, when it is advisable to lightly comb each day to remove the loose hair. The breed has a firm foothold in Finnish and British kennel circles and there are gradually increasing numbers in many overseas countries including the Americas, Australasia, Europe and the Nordic countries. 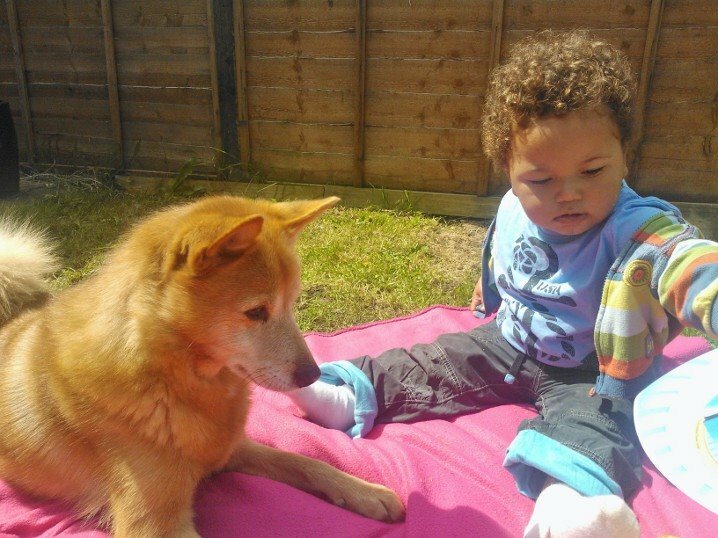 When the breed was first introduced to Britain in the 1920s, it was initially known by the Swedish name of Finsk Spets until the familiar Finnish Spitz came into use in the mid 1930s.